September 4 – October 15, 2010 EXTENDED TO NOVEMBER 13, with a closing book signing and reception. Golden Decade Poster. Students at the California School of Fine Arts during the first Golden Decade of Ansel Adam’s photography department while Minor White was lead instructor, Edward Weston was field instructor and guest lectureres included Imogen Cunningham, Dorothea Lange, Lisette Model and other definers of the medium. The California School of Fine Arts (CSFA) in San Francisco (renamed the San Francisco Art Institute in 1961) was among a handful of institutions in the nation to offer an extensive program in photography and film during the period immediately following WWII. The importance of the school and its influence, not only on West Coast Photography but on photography as a whole, has been far-reaching, lasting well into the 21st century. The first decade of the program, 1945-1955, gave rise to a unique group of photographers who went on to become accomplished artists and important contributors to visual culture. 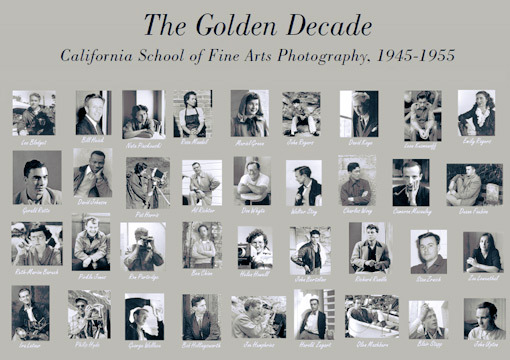 The Golden Decade focuses on 32 of these students and how they influenced and supported each other during, and in the years following their time at the California School of Fine Arts. The California School of Fine Arts Golden Decade artists include Pirkle Jones, Ruth Marion Baruch, Philip Hyde, William Heick, Pat Harris, Bob Hollingsworth, Cameron Macauley, Ira Latour, Benjamen Chinn, Rose Mandel, David Myers, John Upton and others. Their work has been represented in important photographic historical events such as The Family of Man Exhibition (1955, New York and international venues) and The Perceptions Exhibition (1954, San Francisco), and many of these California School of Fine Arts photographers were prominently featured in the early issues of Aperture magazine. A number of Golden Decade photographers have had books published, notably Pirkle Jones with his wife, Ruth Marion Baruch, Philip Hyde, and John Upton. Sounds like an intriguing exhibit. I’ve had lunch in San Anselmo and driven by there many times in the past but hadn’t seen this gallery. Nice little town. Smith Anderson North just moved to San Anselmo from down the street in San Rafael. Smith Anderson North used to be a frame shop and small gallery, now it is a huge gallery and frame shop. Stefan Kirkeby, the proprietor, does framing for many of the major museums in San Francisco. Right now he is framing the Fisher Collection for the major expansion of MoMA. He makes these incredible thick but light wood frames out of all sorts of great hardwoods that can be sanded down and repainted if they get dinged. They last forever and are much more durable than metal frames for traveling exhibitions. With his small gallery and full-page ads in Black and White Magazine, he has developed a great following of collectors who are primarily interested in the early black and white prints from the 1940s, 1950s and 1960s. An era that many have overlooked, that has yet to get proper recognition for the incredible photography it produced. The golden decade — aptly named with a lineup like that. I’ll bet it’s an exhibit that’ll bring you right down to your knees. Hi PJ, thanks for stopping in. It will be magnificent. Some of the best vintage black and white prints and printing in the history of photography all gathered in one place. If you get a chance, David, could we see photos of the exhibit? I would enjoy seeing the film also – is it going to be released in theaters or on television? This will be an incredible exhibition, I’m sure. Hi Sharon, the Golden Decade exhibition will be well-worth seeing. I am not sure if they will scan any of the photographs for the internet. It’s a good idea. I personally can’t take on a project like that, perhaps Stefan Kirkeby, curator and proprietor will put them online. Some galleries do. I am getting photographs together for the upcoming show in Denver at Camera Obscura Gallery. I will be announcing that next. several good tips in Features also. It’s So much appreciated!